It’s that time of the season for fantasy sports. Something caught my attention that I felt deserved a bit of a deeper dive. I’ve become increasingly aware, thanks to a hefty dose of Nate Silver’s work, of the hidden data behind the spectacle of the sports, so why am I not applying what I am learning to help me analyze players and take an objective approach? I chose one of my favorite players as my subject, Stephen Curry. He has such a unique style of play that by and large presents a threat wherever he has the ball. He obviously dominates from field goal range, but is it fair to say that is where he is strongest? It is hard to pin such a well-rounded player as a long-range v. short-range shooter when he also dominates in the paint. 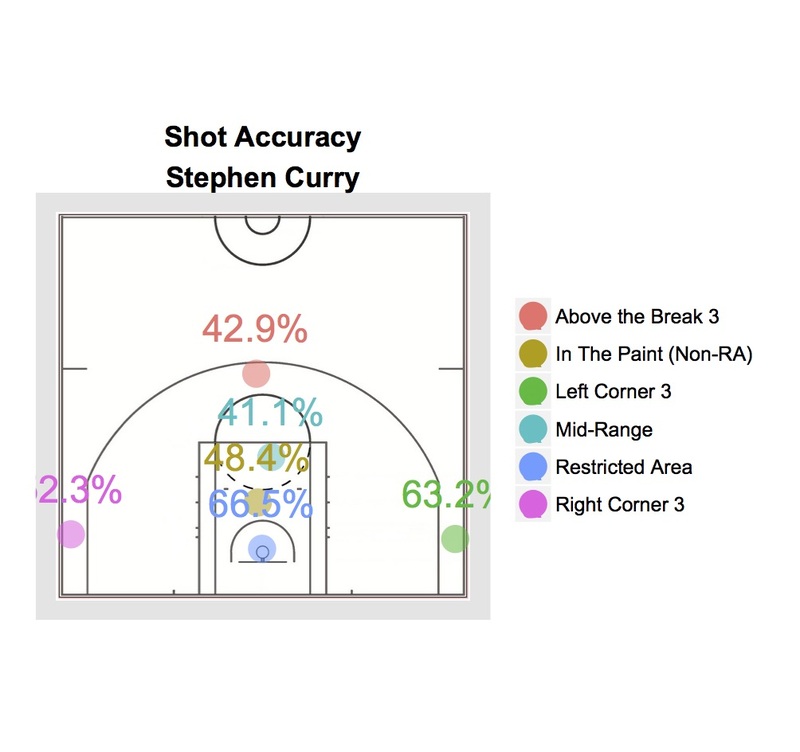 Curry is a great subject because we need to rely on the stats to apply an accurate label. 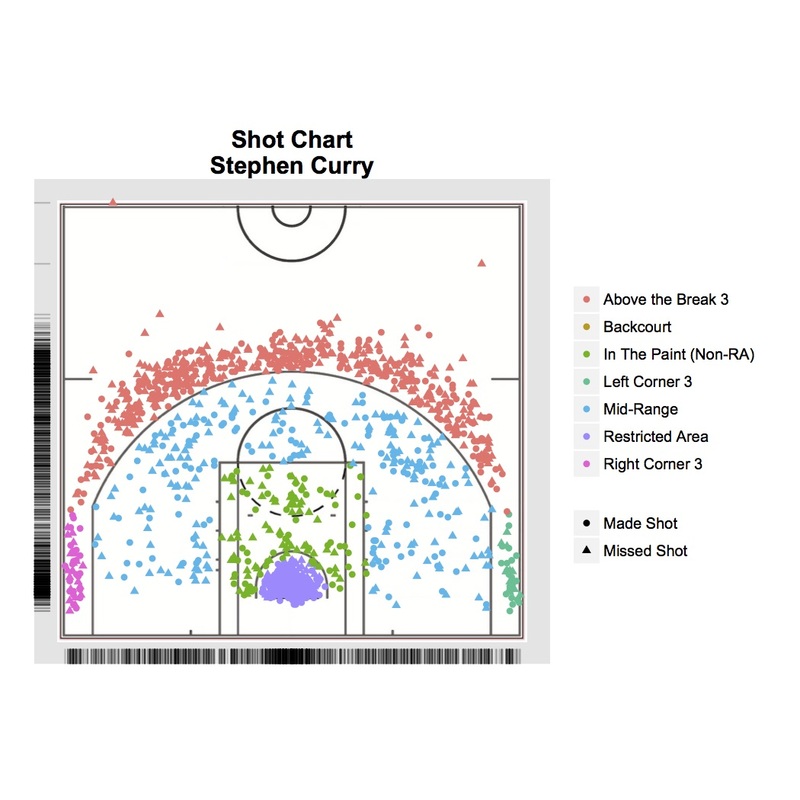 After some trial and error, I figured out how to scrape and plot Curry’s 2014-15 regular season shot data using R. The plot below shows a pretty well rounded shooter who not only favors long-range and close-range in the paint shots while shying away from mid-range (likely due to height), but is also dangerous at both. The plot above can be a bit misleading, so I also plotted it below with clear shot statistics. Since some of the numbers got cut off on export, that’s: 42.9% Top of the arch, 52.3% Right corner 3, 63.2% Left corner 3, 41.1% Mid-range, 48.4% In the paint, 66.5% Restricted area. I now understand why Curry’s versatility has earned him the very appropriate nickname, “Baby Faced Assassin.” Hope was illuminating for you as it was for me. Time to make some trades.